Dental implants provide restorations that look and function like our natural teeth. They are a fixed solution to missing teeth, meaning that they are not removable and have no loose components. They provide a stable and comfortable replacement for missing teeth, and can be placed in between natural teeth. If properly cared for, dental implants can last a lifetime. Dental implants have an overall success rate of nearly 95%. The surgeons in this practice place dental implants. 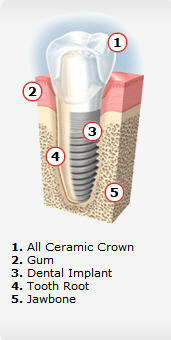 However, you will also need to see your dentist to restore the implant with a crown. The surgeons will work closely with your dentist to plan out and provide the best possible treatment. Improved appearance: When you lose the entire tooth - both crown and root - shrinkage of the surrounding bone can occur. Over time, and with loss of multiple teeth, the areas can become more difficult to restore and maintain. Also, bone loss can lead to a more aged appearance. Dental implants can stop this process by preserving the surrounding bone. A traditional denture or dental bridge does not preserve bone. Preserve natural teeth: With traditional dental bridges, teeth adjacent to missing teeth are normally cut down to be used as anchors for a dental bridge. Dental implants often eliminate the need to modify healthy teeth. Implant-supported replacement teeth look, feel, and function like natural teeth. This means that you can eat and drink whatever you choose. But most importantly, dental implants often improve quality of life in an amazing way. People who have felt embarrassed and worried because of their dental problems are often overwhelmed by what new permanent teeth can do for their self-esteem. How much time is required for dental implant placement? The conventional process can take from three to six months. First, the surgeon places the dental implant, which is left for three to six months to heal and integrate with the jawbone. During the healing period, your are given a temporary prosthesis until the permanent crown is put in place. Your surgeon will work along with your dentist to provide this. The procedure chosen depends on several factors, such as your dental health, the number of teeth involved and which teeth are replaced. These factors will also determine the total number of visits to the surgeon throughout the treatment period. Dental implant surgery should never be painful. There are a variety of anesthesia options that can be discussed with your surgeon to ensure that you have the most pleasant, comfortable experience possible. As with any surgery, there can be some mild discomfort following surgery. Placing one implant normally causes less discomfort then placing several. However, most patients report that they were much more comfortable following the procedure than they had anticipated. Your doctor will prescribe medications to ease any discomfort that may occur. Ask your surgeon to recommend another patient who has already had tooth replacement therapy to assess their personal experience. It is normal to have some bruising and swelling in the gum and soft tissues. Usually the discomfort, if any, is managed with an over the counter pain medications. Your doctor will provide any additional prescription medications that are necessary. You should expect to be able to work the next day. Your new teeth must be cared for and checked regularly, just like your natural teeth. Brush and floss as recommended by your dentist or dental hygienist. See your dentist everysix months, or more frequently if so advised.